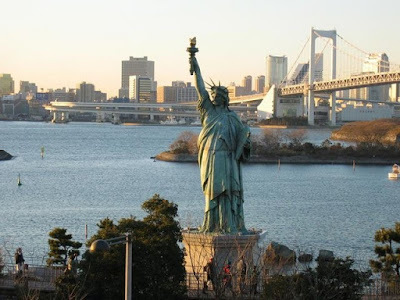 The giant statue titled Liberty Enlightening the World has become a symbol of the United States and of freedom to oppressed people everywhere. 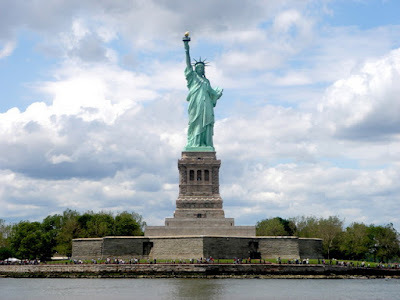 It stands on Liberty Island in New York Harbor. The statue was a gift from the people of France to the people of the United States commemorating the alliance of the two nations during the American Revolution. The majestic sculpture in Upper New York Bay is one of the largest statues ever built and attracts about 2 million visitors each year. Édouard de Laboulaye, a French historian, proposed in 1865 that his country present a suitable memorial to the United States on the 100th anniversary of the signing of the Declaration of Independence. 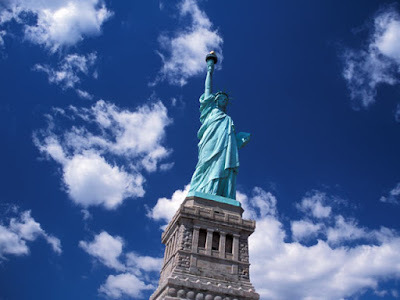 The Franco-Prussian War intervened, but in 1874 an Alsatian sculptor, Frédéric-Auguste Bartholdi, went to New York City to confer with American officials. The Franco-American Union was formed to collect the funds. The total cost of about 1 million francs was contributed in France by popular subscription. Americans subscribed 250,000 dollars for the pedestal. The statue was dedicated on Oct. 28, 1886. 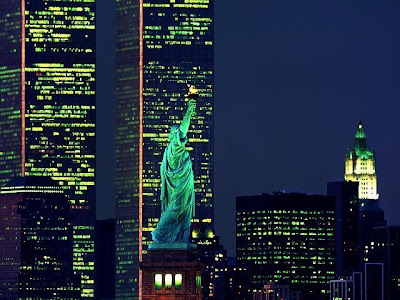 In her uplifted right hand Liberty holds a gilt torch illuminated by lights on the balcony. In her left hand is the tablet of law bearing in roman numerals the date July 4, 1776. A broken shackle representing tyranny lies at her feet. The seven spikes in her crown represent freedom's light shining on the seven continents and the seven seas. The star-shaped wall around the base of the statue is the wall of old Fort Wood which was built on Bedloe's Island from 1808 to 1811. The statue was made a national monument in 1924 and is maintained by the National Park Service. 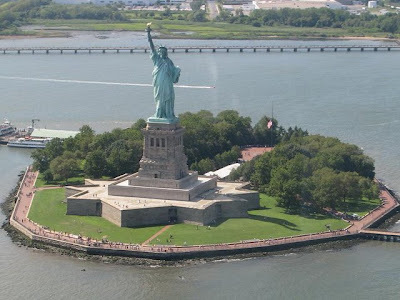 In 1956 Bedloe's Island was renamed Liberty Island, and in 1965 nearby Ellis Island was added to the national monument. The American Museum of Immigration in the base of the statue was opened in 1972. The figure is composed of more than 300 copper sheets 3/32 of an inch (2.4 millimeters) thick and weighing a total of 91 tons. It is supported by an iron framework designed by Alexandre-Gustave Eiffel, builder of the Eiffel Tower in Paris. Bartholdi first built a 9-foot (3-meter) model. This was enlarged to a figure 36 feet (11 meters) tall, which was divided into sections. Each section was further enlarged to full size, and the copper was hammered over patterns. In the assembled statue each section of the shell was bolted to the central framework. Liberty's 150-foot (46-meter) pedestal was completed in 1886 and was for a time the largest single concrete structure in the world. The base contains stairways and a passenger elevator. The overall height of the structure, from the base of the foundation to the top of the torch is 301 feet 1 inch (92.99 meters). Liberty herself is, from feet to torch, 151 feet 1 inch (46.05 meters) and weighs a total of 204 tons. Two spiral stairways, one for upward traffic, the other for downward, extend inside the sculpture from its base to Liberty's crown, where there is an observation deck. Each stairway has 142 steps. Visitors are not permitted to ascend to the torch. 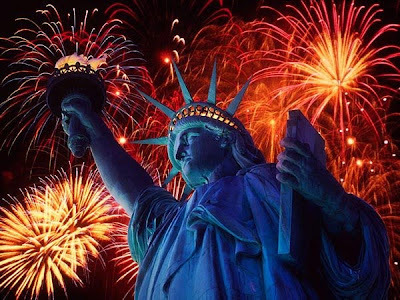 A four-day festival centering on July 4, 1986, marked the 100th anniversary of the Statue of Liberty and the end of a four-year repair and restoration program costing 66 million dollars.